This is one of my all-time favourite cards. I was really happy with the simple layout & the slightly unusual colour combination. 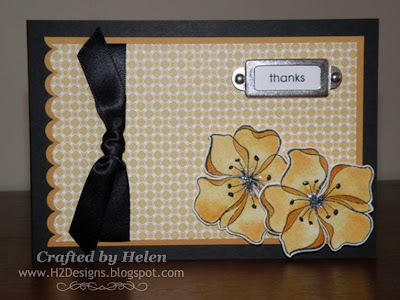 The flowers were coloured using stamp pad ink & an aquapainter. Dazzling Diamonds were added to the centres of the flowers & dimensional magic was added to the tips of the stamens. The flowers are raised on dimensionals.